After last week's Free GM Resource of 2013 ENnie award nominations for Best Free Product I received a note from someone associated with one of the items up for the Best Free Game category. While I could simply do another posting of those free games, you can just as easily go over to the ENnie page and look for yourself. This week's Free GM Resource is just one of the nominations. I'm only listing this one because it hits a soft spot for me. For many "old school" players there is a bit of pride about when you started playing Dungeons & Dragons. My introduction to Dungeons & Dragons goes back to 1978 when I was seven. I had one uncle that is a few years older than me and he wanted to play AD&D after seeing another uncle's PHB. We both read and re-read the rule books until we got our hands on the D&D blue box set. Our games were more structured fantasy than bona fide games of D&D and all I really remember is playing with all these rule books and one really absurd adventure. My first "proper" game of D&D didn't come until 1983, but by then I had years of these infrequent sessions with long stretches of just the rule-books to tide me over. Mazes & Perils really takes me back to the early days of gaming when it was more about the shared story & experience and less about the rules written down on paper. 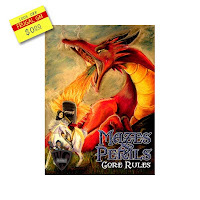 This 61 page Core Rules book is inspired by the Holmes version of D&D and is a great way to get a few folks new to RPGs around a table and slinging dice in no time. I encourage you to check it out and possibly vote for it to win an ENnie for Best Free Game. Hey, wanna thank you for giving us a review. As illustrator of that book I feel honored to be nominated with my buddy Vince and am glad you enjoy it. 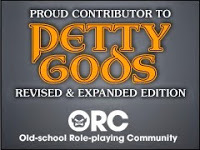 BTW, if you like more old school goodness you might like our podcasts from Wild Games Productions - pocasts for Basic (Save or Die Podcast: http://saveordie.info) 1E (Roll For Initiative Podcast: http://rfipodcast.com/show) and 2E (THAC0's Hammer: http://thacoshammer.info). They're a lot of fun and somewhat informative. You are right sir! Thanks for that.